Last weekend, Farmguy and I gathered our sheep for their spring shearing. We’ve had a number of warm days since early April with temperatures in the 70’s and 80’s, and the sheep were appearing a bit stressed by the heat. I was happy to finally get a shearing date, but also a little nervous about rain as we seemed to be in some kind of cool and wet holding pattern the last few weeks; however, we were lucky on Saturday. The sun managed to come out and stay out, at least until all of the sheep were sheared, dewormed, and had their hooves trimmed. Of course, around here, when it’s 80 degrees in April, go ahead and expect it to be 40 degrees in May, especially when you’ve just sheared seven months of wool off your sweet, lovely sheep. I’m sure they were thinking, “We’ve been baking in all this wool, and now you think it’s a good time to remove it?” Needless to say, I felt terrible. But, I knew a grain treat would help. Typically, we only give the sheep grain in the cooler months as a treat and to increase their body temperatures. Once spring arrives, the pastures are lush with lots of grass, and the supplemental grain isn’t necessary. 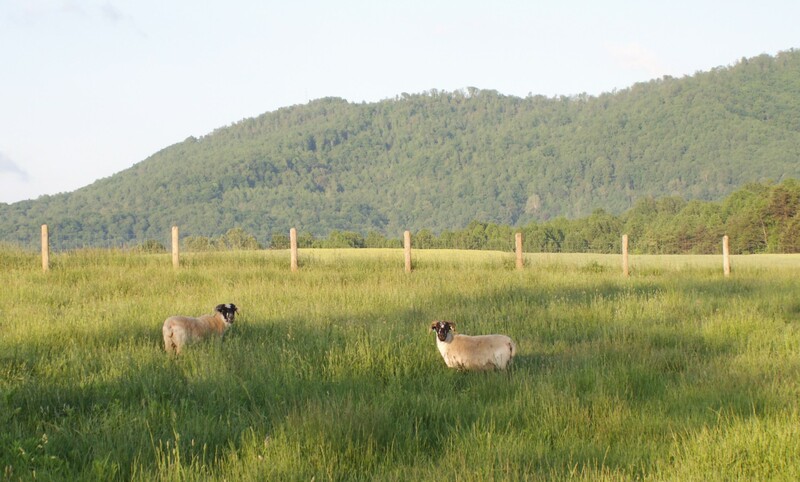 However, we made an exception this past weekend because of the cooler temperatures, and the sheep loved it! It doesn’t take long for them to get into a new grain routine as they’re pretty spoiled rotten. Getting grain a few days in a row translates in sheep logic to getting grain every time they see a human being. So, when this human being went to feed the barn cats today, guess who was standing outside the cats’ windows baaahing—and, may I add, baaahing loudly–in a very demanding kind of way. Yeah, it wasn’t nice. It wasn’t a kind request that may have sounded like this, “Farmgirl, please bring your sweet woollies some grain—baaah.” No! It was more like, “Hey Farm Wench, forget those cats, and get out here now and give us some grain—BAAAAAAAAH!” Despite their menacing BAAAAAAAHs, I did feel badly for the sheep in this weather. So, after finishing up with the cats, I walked over to the pasture to say hello. They were waiting there at the gate, eagerly and expectantly, with all eyes glued on me. They continued to baaaah and BAAAAAAAH! I looked at the green fields full of wonderful grass, but I knew they wouldn’t be satisfied until I disappeared back into the barn and emerged with a scoop of grain. You see, I’m very well-trained by our animals. As I stepped inside the barn, their excited state increased as did the BAAAAAAAHING. I walked over to the grain bin, took the lid off, and stared into an empty container. “Oh, No! I CAN’T go back out there without grain. There has to be some around here somewhere,” I thought. After a fruitless search of the barn for grain, I realized there was none. The BAAAAAAAHs were growing louder and more impatient. I couldn’t face them without the grain. Feeling panicked, I spent a few minutes pondering another way out of the barn. An exit strategy that would allow me to sneak out without the sheep seeing me. It was cowardly; I admit it. But, in the end, I decided to just go out there and tell them. When I walked out of the barn, for a millisecond, they looked so happy and excited to finally be getting their grain. Then, they noticed….there was no scoop. They looked dumbfounded, “What’s going on? Where’s the scoop? What kind of game are you playing?” Looks of total disbelief were stamped on their little sheep faces. I felt horrible! The confused facial expressions and excited baaahs quickly turned ugly. There was lots, and I mean lots of loud, angry BAAAAAAAHING from all of the sheep, but especially Hamish. He was so mad; I believe he would’ve stabbed me if he could’ve. I walked over to them, explaining that it was all Farmguy’s fault for not telling me sooner that we were getting low on grain. I apologized and tried to pet them, but it was no use. There was no grain, and that’s all that mattered. I enjoyed this post. I guess sheep aren’t all that much different from every other animal. Heaven forbid I try to leave the house without giving Puppy Cody a biscuit! Oh my gosh, I giggled and cackled my way through this post! Thanks for the laughter! I deal with cats like that, and my big boy, Catticus, is sooooo loud. No one can sleep through his meowing racket! I cannot imagine SHEEP goin at me like that! Hysterical post! That’s such a nice comment! 😊 I’m so happy you thought it was funny. That’s really nice!! 😀 Thanks so much, Joey. That’s what you get for spoiling them in the first place. you’re a good sheep Mom. Oh my how funny! I get it as when I make our packed lunches Sonu Singh knows so he stands by my feet expecting a bit of ham or chicken to be thrown down. .. and the miaow are intense!!! The baaaaaing must have been LOUD!!! The baaaaaing was very loud….the sheep were not happy with me. They are very demanding–for sure! Thanks, Van. I love this post! So cute, I cannt resist…you were very baa-d to let those sheep run out of grain! Thank you so very much. That’s really nice of you to say! Happy you enjoyed it!! That’s so kind! Many thanks. Our animals are sheer entertainment sometimes. I feel very fortunate to live on a farm.